In general, ride-on brands do seem to focus only on the younger children with kids electric vehicles. So, in this review, we have something for older kids. Good ol' Razor, they have several electric karts in their range of 4 wheeled electric karts for bigger children. 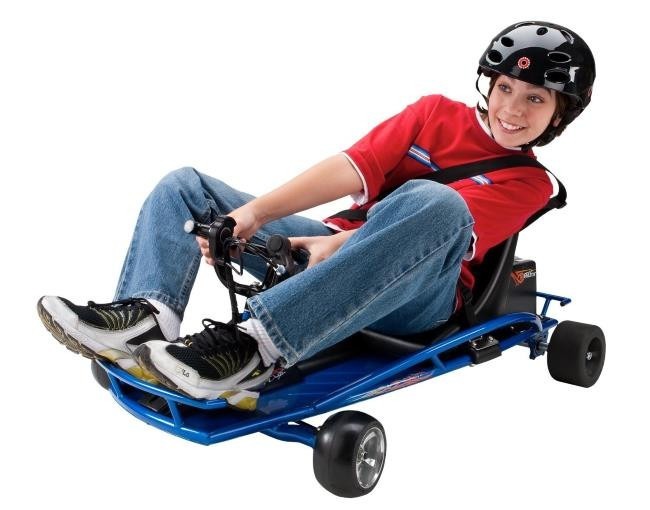 Older kids from the ages of 8 and up can enjoy these electric karts. The only limit that Razor specify is that the rider weight is not more than 140 lbs. This puts the maximum rider age at even a light to medium-weight adult. It's a super strong steel tube frame and the weight rating will only affect the speed of the drifter Kart, rather than break it! The Razor Ground Force Drifter Fury Kart in this review has a manually operated handbrake for the rear wheels on the handlebar. 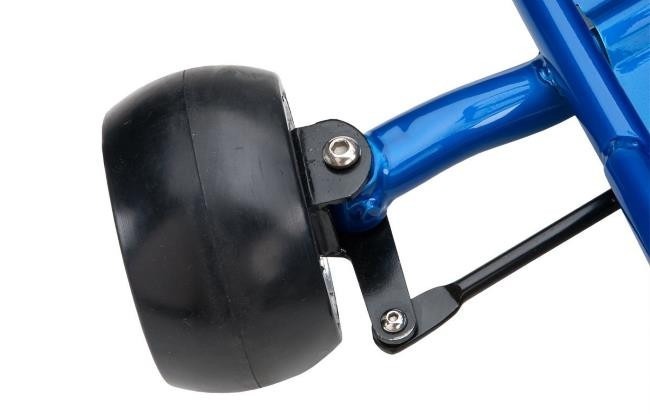 This brake can bring the Kart to a faster stop than just letting go of the throttle and is useful when pulling off some of the tricks like sliding or 180 spins. I notice that some kids feel like the kart is going to tip over when it does the 180 spins, however, this cannot happen. The wheelbase is long and wide and the kart itself is too heavy (at around 65 lbs) to tip over. It is definitely designed and built with safety in mind. that brings me to the flag that comes in the box which is mounted on the back of the kart. This flag is a safety feature because there is no way that an adult could see this kart if they are sitting in a car or an SUV. The kart is far to low to the ground to be spotted by a driver, but they could spot the flag that sticks up much higher than the kart. That said, Razor clearly recommends that the Ground Force Drifter Kart is not meant to be driven on public roads, sidewalks or anywhere near motor vehicles. Best to stick to private ground and your kids will be safe from accidents! This kart is made from steel and durable 'unbreakable' plastic parts. The frame is steel tubing and the floor-pan is a sheet of steel. There are no exposed holes in the floor-pan meaning that kids cannot scrape their feet on the road surface as they travel over it. It's a solid, heavy piece of kit and the paint-work (blue) is tough and durable. The pinions on the steering rack at the front have rubber covers over them so it's hard for fingers to get trapped in any moving parts. The seat is a solid plastic type, it could be a bit more comfortable but I guess you could add some foam strips to it. There is no suspension on the kart at all, but as Razor recommend it should only be used on smooth, flat surfaces I guess that suspension is not really needed. This kart is very easy to build out of the box. There is a Hex wrench supplied which is all you need to build it. You put on the steering section, then the seat and finally the flag and you're done! All that is then required is a 12-hour charge of the battery system to make sure that the battery is fully topped up before riding. The Razor Drifter has 2x 12-volt batteries used in series making this a 24-volt system. That 24-volt battery pack gives the motor enough juice to propel the kart at a cool 12-15 mph! 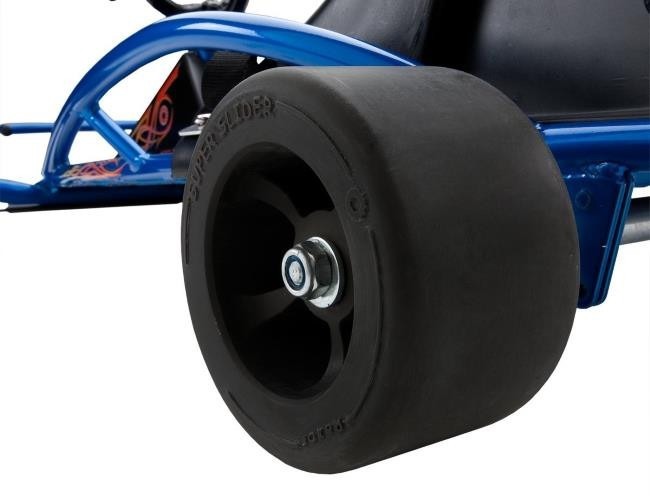 The wheels are unique on the Razor Ground Force Drifter Kart because they are small but solid and will last a while. The Front wheels are molded aluminum with solid rubber tires and the rear wheels are solid tough plastic with larger slick solid rubber tires. It is the larger rear wheels and tires in conjunction with the brake that cause the drifting and 180 spins to occur. From this point of view, the design is pretty clever because the wheels and tires at the rear of the kart are really wide but they slide really well. Of course, this kart is designed to drift which does mean that these rear tires will wear out if you use it a lot. This is by design really - it is a drifter kart, after all, so get used to the idea that you will need to replace the front and rear wheels after a while! You can get hold of replacement rear wheels for less than $50 a set here. The drifter brake is a cool feature and is particular to this model of Razor Kart. It is the brake that enables the fast 180 spins and dead stops. You can also use the brake to power slide around corners. All these tricks are what make the Ground Force Drifter so much fun. The Brake works by squeezing the brake lever on the steering wheel. This is much the same as a bicycle brake. The lever pulls a brake cable that is fed through the wiring harness that goes inside the steering column. The cable is fed out to the rear wheels underneath the Kart, where there is also a secondary adjustment for the brake cable. The brake itself is a belt that grips a drum on the rear axle of the kart, so the harder you squeeze the brake lever, the quicker it will stop. Another nice function is that when you squeeze the brake lever, it also cuts out the motor. This cut-out feature acts as a safety device because kids cannot brake and accelerate at the same time. It also acts to stop the kart real quick which forces it into a 180 spin. The handlebar assembly comes ready-constructed out of the box, you just need to mount it onto the steering column. It contains a couple of controls for the child to use while riding. 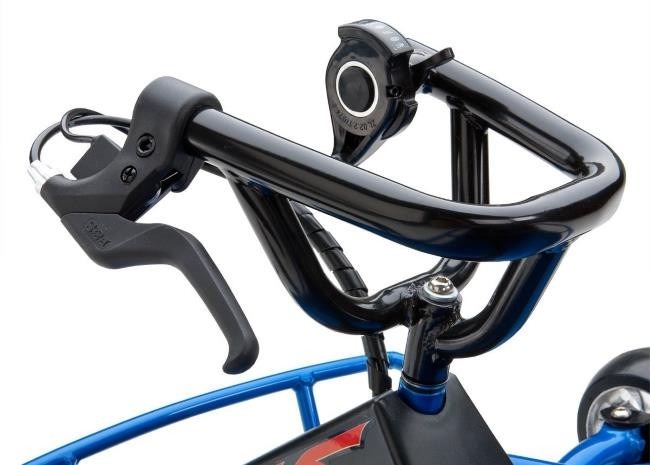 There is the brake, which is a bike-style brake lever and also the throttle control which is mounted on the right hand side. The throttle is variable which means it has both half-speed and full-speed positions. As per the Razor Drifter's manual, the initial charge should be around 12 hours to fully charge the battery pack. You need to switch off the power of the kart using the switch at the back. Then pop the plastic cap off the charging socket next to the power switch at the rear of the Kart. Plug the supplied charging cable into the kart's charging socket and plug the charger unit into the wall socket. It's best not to leave the unit charging for too much more than 12 hours..
One charge should last for around 45 minutes to one hour of riding time and provide about 7-8 miles of travel distance. That's pretty good going and as subsequent battery charges should take no longer than 6 hours at a time. This means that the kart can be ready to go the next day for another fun session outside. Assembled Product Dimensions: 39.5" x 26.5" x 16"
All in all, there is a reason why the Razor Ground Force Drifter Electric Kart is a best seller - it's a lot of fun. This kart has a great design, is strong and tough enough to withstand all the bumps that you would expect. With electric scooters all the rage this year, why not go for something a little different and treat your kids to a cool electric kart like this one? Razor Ground Force Drifter Go-Kart - Unboxing, Assembly, and Racing! Video of Razor Ground Force Drifter Go-Kart - Unboxing, Assembly, and Racing! These Razor Drifter Karts are so well built, they get a 5 star rating! Is The Power Rider 360 Electric Trike The Coolest Kids Ride-On Toy?